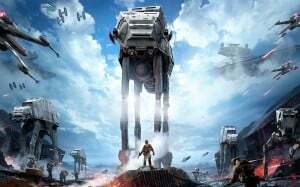 Star Wars Battlefront Open Beta Release Date Announced | Nerd Much? EA and DICE have announced that the Star Wars Battlefront open beta release date has been set for October 8 and will run through October 12. The beta will be completely open to all PS4, Xbox One and PC players, allowing any and everyone to download the game and play it. As all betas, it is intended to be a technical test for the dedicated servers, and EA and DICE are hoping to avoid botching one of the biggest game launches of 2015 (they don’t want another disaster like Battlefield 4). Players will be limited via a level cap, as they’ll only be able to advance to level five. Your stats and progression will not carry over to the final game or the final companion experience. Players will have the option to choose from three different game modes. The three modes included are Drop Zone on Sullest, Walker Assault on Hoth, and the solo/co-op mode Survival on Tatooine. For more details on those modes, check out the official post from the Battlefront website. The beta download will be around 7GB for the Xbox One and PS4, and 11GB through Origin on the PC. Players will be able to pre-load the Beta on PC beginning at 1AM PT on Wednesday, October 7. Meanwhile, the full retail release for Star Wars Battlefront has been set for November 17, 2015. We’ll see you out there for the beta.